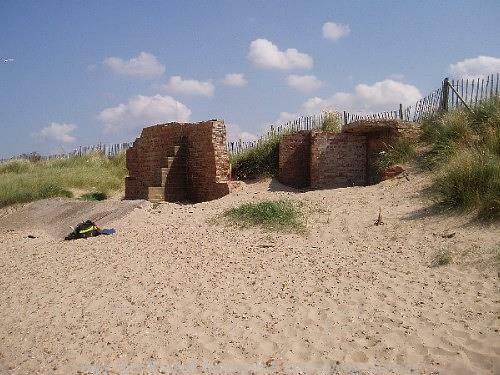 A World War two coastal battery consisting of two brick and concrete roofed gun houses connected by a semi underground complex of magazines and shelters can be seen on aerial photographs of this area and partly remain within and exposed from the sand dunes. This is the best preserved battery in Norfolk. It has been attacked by coastal erosion. 1941 Coastal Battery, very rare, now damaged and at risk, but at one time the best preserved example in Norfolk. D. Gurney (NLA) 24 February 1995. An arrow shaped bombing range marker is visible as a structure at TF 7552 4522 in 1945 aerial photographs (S2). This feature is still visible in 1946 aerial photographs (S2), and another arrow shaped bombing range marker is also visible at TF 7749 4523. These features demonstrate the military activity in this area during World War Two and its aftermath. These features are found within the area of the coastal battery and may have been used in conjunction with it. A. Hunt (NMP), 29 January 2001. May to November 2004. Norfolk Rapid Coastal Survey. Remains of Brancaster Second World War Coastal Battery. Comprised two brick and concrete buildings, both in situ and displaced on the face of sand dunes. The westernmost building [context 641] was recorded between TF 77360 45203 and TF 77366 45203, whilst the easternmost [context 711] was between TF 77431 45220 and TF 77445 45227. Debris from Second World War coastal battery. A scatter of four sections of brick wall, one concrete slab and loose reinforcing rods were situated at the toe of the sand dunes between TF 77545 45272 and TF 77565 45278. Some elements were loose and some were partly buried in the sand. --- Photograph: HAZ 1-31, HAZ. <S2> Vertical Aerial Photograph: RAF. 1945. RAF 106G/UK 476 Frms 4106-4107 6-JUN-1945 (NMR). <S3> Aerial Photograph: RAF. 1946. RAF 106G/UK 1571 Frm 3015 7-JUN-1946. <S4> Unpublished Document: Robertson, D., Crawley, P., Barker, A., and Whitmore, S.. 2005. NAU Report No. 1045. Norfolk Rapid Coastal Zone Archaeological Survey. Assessment Report and Updated Project Design..